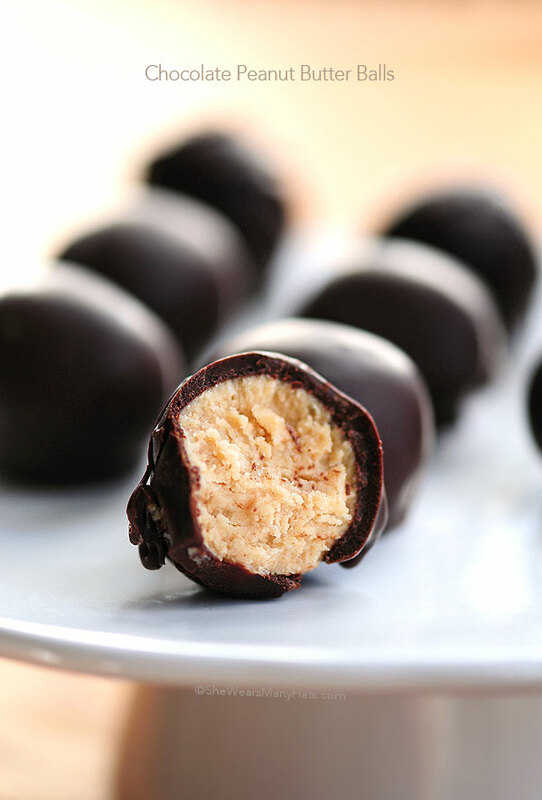 These Chocolate Peanut Butter Balls are certainly an old favorite and much better than anything you will find in the candy aisle. Are there ever enough Chocolate Peanut Butter Balls to go around? I don’t think so. Chocolate and peanut butter is a combination that’s hard to beat, don’t you think? These easy treats are perfect for parties or as a surprise for any chocolate and peanut butter lover. Watch them disappear! 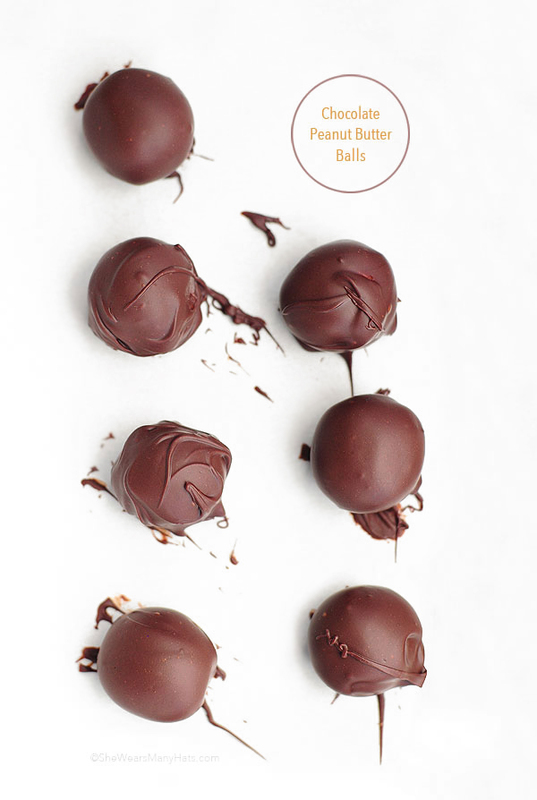 Plus, these Chocolate Peanut Butter Balls couldn’t be easier to make. Really. Dipping treats in chocolate may be intimidating to some, but once you try it a couple of times, it is really very easy. I promise. Be sure to check out the Chocolate Peanut Butter Balls Recipe notes below for all kinds of helpful tips. Make sure there is room in the fridge for chilling a baking sheet of these. Chilling is important! The peanut butter dough can be made ahead, tightly wrapped in plastic and refrigerated for a couple of days until ready to form the balls. Finished peanut butter “dough” should be firm enough to make a ball that holds together. Additional powdered sugar (confectioners sugar) may be needed. Just add a tablespoon or so until the correct consistency is reached. Warm hands will make the dough soften. If dough begins to soften, return the dough to refrigerator to firm back up for a little while. The same can be said for working in a warm space. If it’s hot where you are, you may need to keep returning the dough to the refrigerator, and/or add more powdered sugar to thicken up dough. A wooden skewer or thick toothpick will help for dipping the peanut butter balls in chocolate. Once dipped and excess chocolate has dripped off, slide a fork under the ball (skewer between tines) and pull the skewer out from below, while holding ball with fork. Then use skewer to gently push ball off of fork onto lined baking pan. For chocolate dipping, try this tip I learned from my friend, Bakerella. Once dipped in chocolate, while holding the skewered peanut butter ball over container of melted chocolate, gently tap your wrist or hand with your other hand until the excess chocolate drips off. I thought it was an odd thing to tap my wrist or arm instead of just shake the stuff off, until I tried it. Works like a charm! Peanut Butter treats always makes me feel sad for those that are allergic to peanut butter. For those with peanut allergies (and those who like almonds) check out these Chocolate Almond Butter Balls. 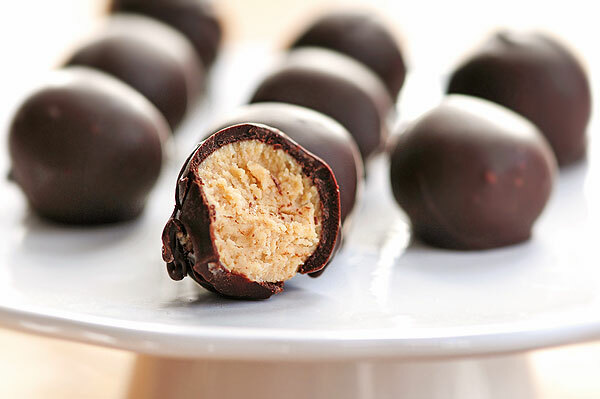 Chocolate and peanut butter are an all-time favorite combo for many of us, plus, these Chocolate Peanut Butter Balls couldn't be easier to make. Mix peanut butter and butter together in a mixing bowl. Gradually stir in powdered sugar until combined well into a dough ball. If needed, add more powdered sugar a little at a time until mixture holds together in a large ball. Cover and let peanut butter dough sit for about 15 minutes to firm up, or cover tightly with plastic wrap and refrigerate until ready to form balls. Shape into 1-inch balls, place on a baking sheet, cover and refrigerate for at least 20 minutes to allow to firm up. Dough balls should hold shape before dipping in chocolate. Add more refrigeration time if necessary. The peanut butter dough can be made ahead, tightly wrapped in plastic and refrigerated for a couple of days until ready to form the balls. Once peanut butter balls are formed, they can also be covered in plastic wrap ad refrigerated until ready to dip in chocolate. Finished peanut butter "dough" should be firm enough to make a ball that holds together. Additional powdered sugar (confectioners sugar) may be needed. Just add a tablespoon or so until the correct consistency is reached. If peanut butter dough seems too soft, tightly wrap dough in plastic and refrigerate for about 20 minutes to firm up before forming balls. Warm hands will make the dough soften. If dough begins to soften, return the dough to refrigerator to firm back up for a little while. The same can be said for working in a warm space. If it's hot where you are, you may need to keep returning the dough to the refrigerator, and/or add more powdered sugar to thicken up dough. If concerned with peanut allergies, substitute an almond butter or other nut butter that is allowed for the peanut butter. Wow, this recipe is really easy and looks delicious!!! They are easy, and kinda fun to make too. Nothing like playing with chocolate and peanut butter! I always use the chocolate bark. It melts very well and doesn’t need to be thinned. Stunning photography and I’ll take at least a dozen 🙂 Pinned! Thank you! You are too sweet. I’ll have three dozen waiting for ya. We’ll have a peanut butter ball party! Yummy! Thanks for the recipe! It’s on my to make list! I’d say that’s a great idea! 😉 What could be better than playing with chocolate and peanut butter? 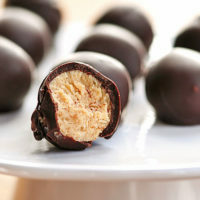 Peanut Butter Balls are one of my favorite things in the world. YUM! Mine too, Robyn! And Randy’s … and Hope’s … Hank, not so much. Can you believe that?!? There is never enough peanut butter balls! Love these, Amy! They look delicious! No, there don’t seem to be enough of them. And as easy as they are to make, I’m afraid. Real afraid. Melted chocolate can be finicky at times. I’m not sure what method you are using to melt the chocolate. Using a microwave to melt chocolate has proven to be a bit frustrating at times for me. I usually use a warm water bath stovetop to melt chocolate (a bowl placed over or in a pot/pan of hot water: check out this link: https://www.thekitchn.com/the-best-way-to-melt-chocolate-alice-medrichs-smart-easy-method-expert-tip-197405). Once the chocolate has melted, I turn the stove off, and leave the bowl of chocolate over the water bath to keep it warm. I hope that makes sense. Also, I have an electric fondue pot that I often use to melt chocolate, then keep it on low or turn it on and off frequently to keep the chocolate melted. These look so simple and so delicious! I’d totally try them with almond butter, too. Let me know how you like them with the Almond Butter. And what about making cashew butter and using that? Whoa. Peanut butter balls are the best! So good! They are a favorite for so many. Dangerously good. LURVE these! They’re just like my beloved buckeye but BETTER! I know! We should get together sometime and make more! Like a ton of em. These are some of my favorite treats!! Love! They’re some of our favorites too, Katrina. I just need to be able to banish them from my mind for a while so I don’t keep making them. So easy and so good. I skipped Christmas; a move was in order and though so happy to be in my new home, I’m sort of craving some of those treats I totally missed. Then this shows up. I could easily take a cue from Heather and play hooky with everything else today and make these. So yum. I’ve been feeling the same way, and just had to take some time to bake and chill. It’s therapeutic, don’t ya think? Glad to hear about your happy new home! Congratulations! Your photos are just awesome – had to stop by and say that 🙂 Can’t wait to try these! These would be so dangerous in front of me because I’m pretty sure I’d eat the entire tray! Susan, don’t ask how many I’ve eaten. Just don’t. We started making these during the holidays. My son has a peanut allergy so we used WOW Butter. Oh my gosh….soooo good! Tastes so much like Reeses (even without real PB) We also used chocolate almond bark for the coating. Oh wow! That does sound marvelous, Alison. And a chocolate almond bark coating … great idea! Whoa…I could pop every single one of those in my mouth right now! Cannot wait to make these! I have to tell you…I just adore the way you styled that shot and the type…it’s perfect! Thank you so much Caroline! It was a fun recipe to make AND eat. They were dangerous to have around. So good! Quick question-does the butter have to be salted? These look so amazing, but I only have unsalted butter on hand. Unsalted is great! If you’d like, add a pinch or two of salt to taste. Quick question: what did you use do dip them in the chocolate? 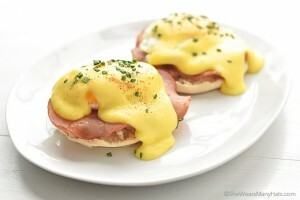 I think i’m going to make these for the Superbowl on Sunday! Natalie, I used a wooden toothpick. A skewer would work well too. I just made these..they were so good. My husband and son loved them. I had to hide them in the refrigerator so they last a few days!..lol! Thank you for the recipe. Yay! I’m so glad you enjoy them. I know what you mean about hiding them. 😉 They are seriously a test for self-control. If the dough is soft, cover it tightly and place it the refrigerator until it firms up. I’ve been making chocolate PB balls for 25 years. I love them. The recipe I was given for the dipping added a small amount of paraffin wax to keep the chocolate glossy and kept them firmer longer without a mess in your hands. I now omitted the wax because I’m not sure how safe it is to eat. Does anyone have any ideas on how to keep the chocolate firmer? Use the chocolate for dipping pretzels. It’s in the baking section of your grocery store. I microwave it and dip the balls. These are so yum-azing! This review is from someone in love, obsessed and constantly eating peanut butter. Other recipes I have used call for too much sugar, the depth of peanut butter is unfairly toned down. I did not make any changes to the recipe itself, only to one of the methods. I do not have a double boiler so I made due with a pyrex bowl affixed atop of a pot filled with water. The only issue with that was it took longer to melt the chips but other than that it worked great. I am thinking about dusting them in peanut chips next time? Slivered almonds? Coffee grounds? Thank you Amy! 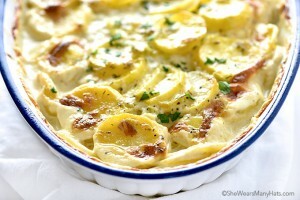 This recipe has helped me wear my “chef” hat proudly! 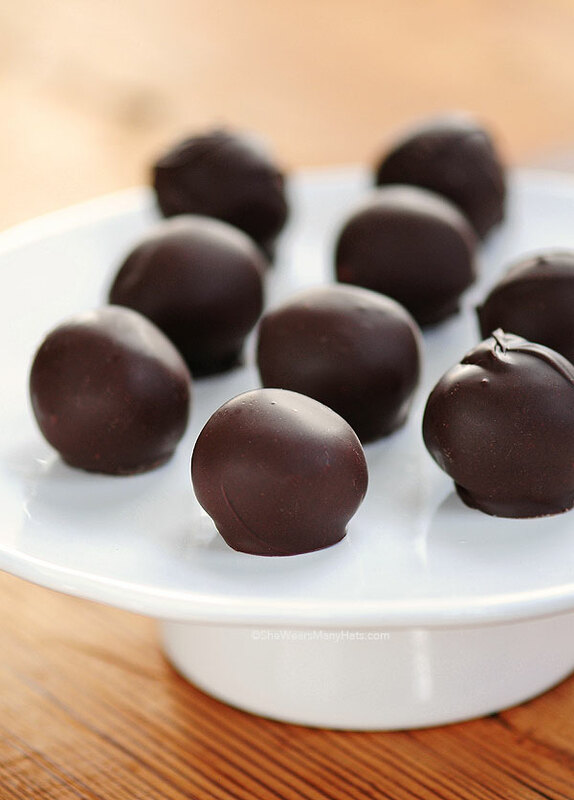 Peanut butter balls are peanut butter balls, and buckeyes are buckeyes. Each done in their own way is “done properly”. I’m not positive about freezing them, but I think they should do okay. The chocolate may change color a bit or get that funky hazy thing that happens sometimes when chocolate is frozen. Maybe if you have time to try a few to test, that would be the best? If you do, please let me know how they turn out. It would be very helpful to freeze a bunch before the holidays and then hide them in the back so they don’t disappear. Merckens melting chocolate is perfect for these. I haven’t tried to freeze them yet, but let me know if you do. My family has made peanut butter balls for years, mostly as a holiday treat, but we always freeze them so we can eat them throughout the year. They freeze amazingly well, and actually that’s now my favorite way to eat them. Add rice krispies to the recipe. I make buckeyes with them and it’s like heaven in a little ball. Oooh … YUM! That sounds like one crispy sweet treat! Thanks for sharing, Catherine. Can you substitute the creamy peanut butter for crunchy peanut butter?? Do you mean substitute crunchy for the creamy? The recipe calls for creamy peanut butter, but you may substitute crunchy. These look delicious! I think I will make these for the holiday work get together. Thanks for sharing! They’ll be perfect for a work party! My Granny made these with me every Christmas on our “Christmas baking day”…. I made them with my children as they grew up and now I am sharing them with my husbands Mother. We have our renewed the “Christmas baking day” I can’t wait to share these with my grandchildren as well! That sounds like a wonderful tradition! I’m hoping to have a baking day as soon as our kids are out of school for Christmas break. Y’all have fun! These have been made for years in my family and I can guarantee we’ve never paid attention to whether is was butter or margarine…cannot tell the difference. My recipe except I add 1 cup graham cracker crumbs in! Amazing!!! Oh yum! I’ll try to remember to try it with the graham crackers next time. How fun is that?!? Did you color the sea salt yourself or find it somewhere? Just made 6 dozen of these for Christmas gifts. Dipped 3 dozen in chocolate and 3 dozen in white chocolate.. Super easy recipe and they are absolutely delicious! ! ! You are a Peanut Butter Ball machine! I bet they were gorgeous. In the old old family recipe I had that too called for wax parafin. To add to the chocolate so it gave th chocolate a nice shine. And I do. Soooo very much Thank u cause I don’t no where it went to. . So I’m very thankful that you posted this… and YES… I’ve also Frozen them befor too… but if everyone loves them witch I’m pritty sure they will… you’ll have to hide them too in th freezer. .. I used to hide mine in a bag empty washed out bag of Sprouts..lol.. or a veg that NO ONE. IN my family liked. …caus if ya don’t hide them..then they’ll find em and eat them all.. once I made quite a few dozen.and I planned on giving them to my friends for xmas. .well I went to get them out of th Freezer to put them in nice boxs… and there was at least over 12 dozen wen I put them in therr. And Omg.???? there where only abt 6. Of them left in there… I was Soooo upset with my kids and fella for rating nearly ALL of them. I just thought I’d share this with you. I like your idea of camoflauging the packaging to hide them! I use a small ice cream, or butter scoop to make these balls, I then freeze them on a cookie sheet, then put them in a plastic bag in the freezer. I have a small glass container that I keep almond bark in. When I need some of these little goodies I just go to the freezer take out what I need, melt the bark in the micro-wave, (I set the ball on a fork over the glass container and spoon the bark over the ball. Since it was frozen the bark solidifies immediately.) This is great for a quick thank you gift, easy and frugal. Great technique! Especially if you just want a couple to enjoy at a time. I have made these for my family for over 30 years. It is one they anticipate and look forward to every Christmas! Hi. So, I just made these peanut butter balls. I doubled the recipe as I am selling them at a 1st grade bake sale. They are good but seem really really really sweet. And I used natural peanut butter. Are they supposed to be so sweet? Also how do you melt the chocolate to get really good coverage? I melted chocolate chips and it was very thick. I skewered the ball and dipped half of it, then had to spread the rest on. I used milk chocolate. They are a sweet treat! You could adjust sweetness as desired, if you’d like. Of course, milk chocolate will be sweeter than a semi-sweet chocolate. As far as melting the chocolate, I melted the chocolate according to package instructions. I used semi-sweet chocolate for these. I’m not sure if milk chocolate would cover any differently. A trick that may help if the chocolate is too thick for you, is to add a bit of coconut oil (the kind that is solid at room temperature) or vegetable shortening to the melted chocolate to thin it out. Just a little at a time, a couple of teaspoons at a time until it’s to your preference. I edited my previous response to clarify that for thinning out the melted chocolate for dipping, if using the addition of coconut oil make sure it’s the kind that is a solid at room temperature or use vegetable shortening, not vegetable oil. Sorry for any confusion. Approximately how many CPB balls will this recipe make? My mom use to make these. You can def freeze. She used the parfin wax as well. One thing she did was squares just as yummy 1/2 the time. Spread the pnut butter mixture in to a oven pan and poor chocolate over and spread set in freezer for about an hour then cut into squares.. She would make tons of squares and leave in freezer in Tupperware bowl and take out as needed…. Those sound delicious and easy, Carolyn! How long do your think they will stay fresh in the fridge? They should be okay in the fridge for about 3 days. I have seen others mention that they freeze well, but they never last long enough around here to make it to the freezer. Happy entertaining, Ashley! They look fabulous! Stumbled upon this and went to the store to get the ingredients! It’s a must make!! I hope you enjoy them, Mollie! Can I freeze the peanut butter balls ahead so I can dip later? Yes, you can. Just keep them covered with plastic wrap or in a ziptop plastic bag. How long will they keep in the frig? I am making some today for a party on the 18th. I am really going to try to not keep eating them. I’m not sure they will last as long as the 18th refrigerated. You can freeze them in a ziptop plastic bag. How long will they stay good storing in the freezer? I love the photography. These looks very yummy. Going to make them tomorrow with the kids. Thanks for sharing your recipe. Do these have to be stored in the refrigerator or would they be okay stored at room temperature? I would like to give them as a gift and would like to have them wrapped up if possible.. They should be okay stored at room temperature, assuming it’s not a hot room. My grandmother made these when I was a little girl, and I loved them. However, I improved on the recipe by using cashew butter, and chopped cashews. Everybody wants more and I can’t stop eating the darn things. That sounds delicious, Shirley! I’ve also made these using almond butter (recipe is here on the site) and I kind of like them better. How many do you get out of one batch? I live in Norway, and are going to make these for christmas. I hope y’all enjoy them, Kathryn! They were delicious!!! Made some for my coworkers, and was told how wonderful they were! Thank you! I’ve lost my old recipe for peanut butter balls! They had the same basic ingredients as this recipe but they also had chopped walnuts or pecans, chopped dates and chopped candied cherries. These added flavors made it hard to stop eating them! I just can’t seem to remember the quantities. I guess there’ll be a few extra batches being made this year until I can get it right. Help I doubled the recipe and the peanut butter mixture is super sticky. Should I just put it in the fridge for a bit? I’ve added extra powdered sugar. Yes, I would try to firm it up a bit by letting it cool down in the fridge. Thank you! I did add some extra icing sugar and refrigerated. They turned out wonderfully! The best I’ve ever had ???? Yay! Happy to hear you enjoyed them as much as we do, Ceri. Loved this recipe and decided to try a new and exciting difference. Half creamy peanut butter and half cookie butter. We are callng them Peanut Cookie butter Balls! Oh wow! That sounds fabulous, Tara. Random side note.. To thicken peanutbutter dough, unlike using a brand called PB2 it is powdered peanutbutter!!!!! Will thicken like the sugar without adding more sweet!!! So love these tho!!! Nom nom nommmmmm! Just made these twice and they turned out terribly. The melted chocolate was much to thick, and the balls fell apart while being dipped. On the second try I spooned chocolate onto the balls, which worked okay but 8 oz was not nearly enough chocolate chips to cover them, and when they were done, they didn’t even taste very good. Much too sweet, gross! Will be finding recipes elsewhere in the future. Maybe it was your error and not the recipie. Just sayin. I just made some and they are awesome!! I used a hole bag of chips and put peanuts in the left over chocolate spread on a sheet. Double peanut Christmas snacking pleasure!! Thanks for the guidance! I made h dough for these the day before Xmas eve and never dipped them. The dough is still wrapped in plastic and in my fridge. How long do you think the dough lasts??? I’m unsure if I should use this dough or make a new batch. Thoughts? Hmmm … I’m not exactly sure how long it lasts, but I would make a new batch. Just a thought…..If it were me I wouldn’t worry so much about the “dough” going bad in the fridge. Peanut butter and sugar sit on our shelves ….how long? If there were raw eggs or milk in the recipe I would be concerned, but not with just the three ingredients listed in the recipe for the dough. So glad i found this recipe! It’s been a few years since I have made pb balls and can’t find my old recipe!!! This will be my 4th time making these. Thank you so much much for the recipe. I use natural peanut butter. Crunchy works well also. They keep well in the freezer. Wow. These look so easy and I like that the ingredient list is simple! SuperBowls, and it is awesome! This year I saw the chocolate/peanut butter footballs & decided to mix it up a bit. I used semi-sweet Nestle chips melted using a double-boiler, but the chocolate was WAY too thick to effectively dip the 1-inch footballs without them coming off the toothpick… not to mention the copious amount of chocolate retained on each ball. Will definitely have to find a way to thin the chocolate if a second attempt is made (I have an aversion to coconut). Seemed like an easy & delicious addition to the SuperBowl party, but my finished project wasn’t party worthy. Great recipe thank you! Made these yesterday for Valentines Day. This was my first attempt at chocolate dipped anything lol. I melted Lindt dark chocolate, put the dough in the freezer for 15 instead so it was a bit firmer, and substituted the sugar for powdered coconut sugar and they came out SO good! Will def make again, cheers ! I made them. I had everyone wanting more of them so I guess I know what to give to family and friends for Christmas lol. I found that using JIF peanut butter works the best. This was so fun at making and I can’t wait to make more. GREAT recipe!!! Why is my dough so crumbly? Won’t stay together when I’m attempting to roll it into the balls.. Thinking about putting in a pan and “frost” it with the chocolate! So frustrated ! If it’s too crumbly, you may need to add a tad more peanut butter or butter to the mixture. Thinned my second batch of chocolate with a little veggie oil. Much easier to dip. The New Year is coming up so I just finished some devine chocolate rum balls to go with my peanut butter balls! Added a touch of rum to this batch. Can’t taste it till you get the boozy aftertaste. I like them both ways! Thank-you Amy for the recipe.